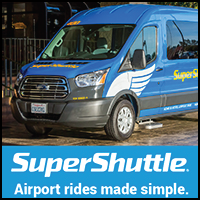 SuperShuttle is the official transportation shuttle service from Phoenix Sky Harbor and Mesa Gateway Airports. Our company has 34 years of experience in reliable, safe and affordable transportation. We are offering 15% off SuperShuttle Shared Ride Services or 10% off ExecuCar Sedan or SUV private services to and from the airport. Must mention The Employee Network when calling or book online using promo code 7A9KJ.